Click on clear browsing data and select all (maybe except addres bar history).And now close maxthon.If it has some history,it will definately freeze and sometimes crash. Click on ctry F and type some keywords.Than close that search window.Open again.Now the keyword is gone.You have to retype.As far as I now,every browser keeps keyword in ctrl F search windows.It is not being deleted upon closing search window. RAM usage should be optimized.If open multiple tabs,RAM easily hits 2GB.Just test it (web sites are not important,just open 7-10 pages) and compare it with other browsers including MAXTHON's previous versions before 4.9 series. 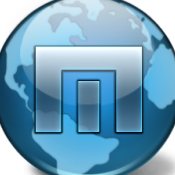 May we know the version of Maxthon you are having all these problems with? Dear Bugsir007, 1 and 3 occur with Maxthon 4.9.x whereas 2 and 4 occur with every version of Maxthon. same problems..still not fixed yet. Well, apparently no one else is experiencing these problem and I'm one of them. As far as I now,every browser keeps keyword in ctrl F search windows.It is not being deleted upon closing search window. Opera doesn't in my testing. But a good point nonetheless. Would be nice to have the find bar stay over different tabs as well. Took forever to come back to mx4.4, then 4.9 came out and it got dropped again. Can't confirm. Tried using 4.9.3.500 multiple times and no issues.